That question is easier for me to answer with basic calculators and graphing calculators than with Graspable Math. Basic calculators make it easy to compute the value of numerical expressions. Graphing calculators make it easy to see the graphical representation of algebraic functions. Graspable Math’s closest cousins are probably the Dragonbox and Algebra Touch apps. All of these apps offer students a novel way of interacting with algebraic expressions. Drag a term to the opposite side of an equality and its sign will change. Double click an operation like addition and it will execute that operation, if it’s legal. Drag a coefficient beneath the equality and it will divide the entire equation by that number. Change any number in that sequence of steps and it will show you how that change affects all the other steps. 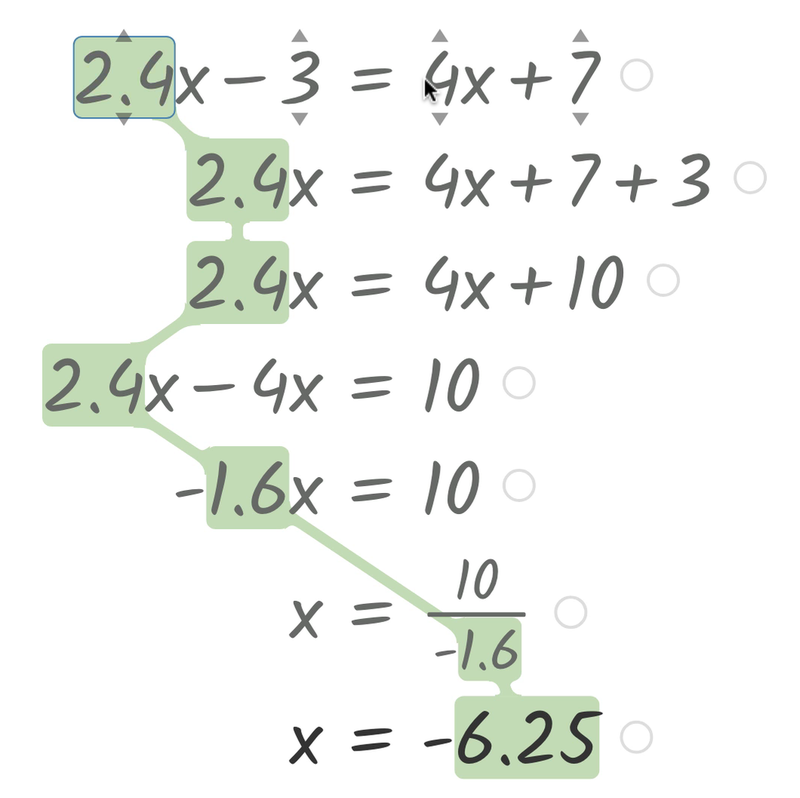 You can also link equations to a graph. 2. Is that a good thing to do? No tool is good. We can only hope to figure out when a tool is good and for whom and for what set of values. For example, if you value safety, an arc torch is a terrible tool for a toddler but an amazing tool for a welder. A graphing calculator is a great tool for a student who understands that a graph is a picture of all the x- and y-values that make an algebraic statement true, a student who has graphed lots of those statements by hand already. A basic and graphing calculator can both contribute to a student’s idea that “Mathematics doesn’t make a dang bit of sense” and “I cannot make sense of it without this tool to help me” if they’re used at the wrong time in a student’s development. The Graspable Math creators designed their tool for novice students early in their algebraic development. Is it a good tool for those students at that time? I’m skeptical for a few reasons. First, I suspect Graspable Math is too helpful. It won’t let novice students make computational errors, for example. Every statement you see in Graspable Math is mathematically true. It performs every operation correctly. But it’s enormously helpful for teachers to see a student’s incorrect operations and mathematically false statements. Both reveal the student’s early understanding of really big ideas about equivalence. In one of their research papers, the Graspable Math team quotes a student as saying, “[Graspable Math] does the math for you – you don’t have to think at all!” which is a red alert that the tool is too helpful, or at least helpful in the wrong way. Second, Graspable Math’s technological metaphors may conceal important truths about mathematics. “Drag a term to the opposite side of an equality and its sign will change” isn’t a mathematical truth, for example. It’s a technological metaphor for the mathematical truth that you can add the same number (3 in this case) to both sides of an equal sign and the new equation will have all the same solutions as the first one. That point may seem technical but it underpins all of Algebra and it isn’t clear to me how Graspable Math supports its development. From an educational viewpoint, I would get rid of dragging across the equal sign. I've been teaching Algebra for 38 years and I spend most of my 'solving equation' time correcting incorrect math procedures because students don't know 'why it works', they just do it. Third, Graspable Math may persuade students that Algebra as a discipline is very concerned with moving symbols around based on a set of rules, rather than with understanding the world around them, developing the capacity for conjecturing, or some other concern. I’m speaking about personal values here, but I’m much more interested in helping students turn a question into an equation and interpret the solutions of that equation than I am in helping them solve the equation, which is Graspable Math’s territory. These are all tentative questions, skepticisms, and hypotheses. I’m not certain about any of them, and I’m glad Graspable Math recently received an IES grant to study their tool in more depth. While Graspable Math is free for teachers and students, money isn’t the only way to measure cost. Free tools can cost teachers and students in other ways. For instance, Graspable Math, like all new technology, will cost teachers and students time as they try to understand how it works. Graspable Math performs algebraic operations correctly and quickly but at the cost of having to learn a library of gestures first, effectively trading a set of mathematical rules for a set of technological rules. (There is a cheat sheet.) That kind of cost is at least as important as money. 4. What do other people think about this? I spent nearly as much time searching Twitter for mentions of Graspable Math as I did playing with the tool itself. Lots of people I know and respect are very excited about it, which gives me lots of reasons to reconsider my initial assessment. While I find teachers on Twitter are very easily excited about new technology, I don’t know a single one who is any less than completely protective of their investments of time and energy on behalf of their students. Graspable Math may have value I’m missing and I’m looking forward to hearing about it from you folks here and on Twitter. BTW. Come work with me at Desmos! If you find these questions interesting and you’d like to chase down their answers with me and my amazing colleagues at Desmos, please consider applying for our teaching faculty, software engineering, or business development jobs. 2018 Jun 11. Cathy Yenca pulls out this helpful citation from Nix the Tricks (p. 54). 2018 Jun 11. The Graspable Math co-founders have responded to some of the questions I and other educators have raised here. Useful discussion!